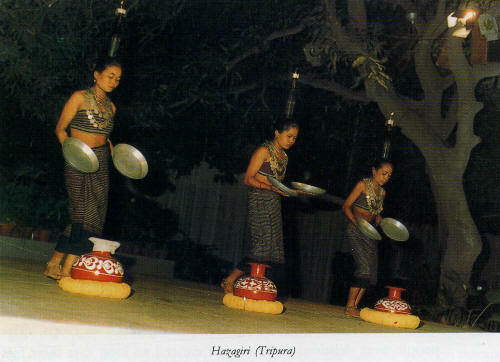 The Riangs of Tripura perform Hazagiri dance in the lunar month of Bhadra (August/September). Actually, Hazagiri is a form of Lakshmi, the goddess of prosperity. The Riangs practice Jhum (shift) cultivation. When the crop is ready for harvesting Hazagiri dance is performed invoking goddess Hazagiri for a bumper crop. The rituals begin with the worship of nine gods and culminate in worshiping goddess Hazagiri. It is performed by the girls of Riang community. They wear a lungi – like striped skirt and blouse, usually made of black cloth. As a part of the dance they perform on an earthen pitcher. In most of the dances with pitcher, it is balanced on the head as in Karagam of Tamil Nadu. In Hazagiri the dancer balances herself while dancing on it. The pitcher symbolizes the human body. When a dancer dances on it the symbolism is that the dance, which is performed for invoking goddess Hazagiri, is beyond the physical existence of the dancer. It requires a lot of practice to remain in balance while dancing on the pitcher. The musical instruments used with this dance are Khamb, the drum, and bamboo flute.